Because it’s really hard to do a blog post while you’re presenting, I’ve done this post in advance based on what I think I’m going to say. I’ll plan to update it later based on the discussion, and invite comments or questions to clarify what we’ve presented. First, I took issue a bit with Shel Israel’s advice in yesterday’s panel to hire young kids to do your social media work, because they just naturally “get it.” I think that’s fine to a point, but it can’t be an excuse for not becoming conversant with social media. This area is growing so quickly and will be so important, that it amounts to “media malpractice” if you are a professional communicator who doesn’t have first-hand knowledge of Facebook, MySpace, YouTube, blogging, Twitter and other technologies that are quickly becoming mainstream means of communication. If you want to stay connected with me and learn about this together, you can Friend me on Facebook and go to my 12-step social media program for PR pros. For more than 100 years, word of mouth of satisfied patients and their families has been the main way people find out about Mayo Clinic and therefore see it as a place they would want to go with their complex medical problems. Another key driver of Mayo Clinic’s reputation, since we don’t do national advertising, has been news media stories. That is the main topic of my presentation, since I work in media relations. But in the future, we will see a synergy of word of mouth with media through “prosumer” social media. It all comes down to people telling their stories, either directly face-to-face or potentially globally through news media or social media. My co-presenter, Angie Jeffrey of VMS, gave some background on the Share of Discussion metric for news media that she has developed, and showed how it has correlated to business outcomes. Then I showed a few high-level slides from syndicated Share of Discussion studies Angie’s group has done that involved us, and related results from media to public perceptions about Mayo Clinic and some other outcomes. Finally, I think it’s overly ambitious to try to boil down all media, both mainstream and social, into a single PR metric, as Microsoft described yesterday. Communications is mind-numbingly complex, as Jim Macnamara said yesterday, and today’s prosumers get information from lots of sources. Some we can measure and others we can’t. But just as physicians use tests of blood pressure, LDL, triglycerides and other indicators which correlate with health outcomes (but may not actually be the causes of disease) to decide how to treat patients, so a set of measures like Share of Discussion and appropriate social media indicators can be used as “screening tests” to identify potential problems and opportunities. To be affordable, especially for non-profits and not-for-profits, these tools need to take advantage of automation to deal with the immense amounts of communication that is happening in the “everyone is a publisher” world. 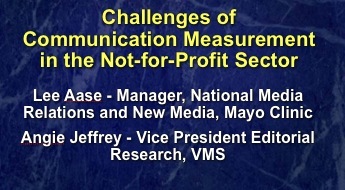 Thanks to the Institute for Public Relations for putting on this Summit on Measurement and for the opportunity to present and to connect with so many interesting people. This has been a valuable learning experience for me, and I hope our presentation has been helpful for others. I LOVE Lee’s Law about measurement vendors — but I wasn’t fast enough to copy it all down. I want to frame it and put it on my office wall! Can I get a copy of the slide? If I had a longer time to pontificate, I would have use Saturn as an example of my thinking. In that case, America produced a car that could have competed with Toyota & Honda, but the GM decision-makers had come up out of the Chevrolet division. Their hearts were with the way it used to be. I see too many marketing and communications departments entrenched in doing what they have always done, while providing some uncommitted lip-service to the new Saturn people. My fear is that is the fate of the social media of social media people in environments where command and control is still embraced and beloved. If experienced pros have it in their hearts to change–that’s an entirely different situation. I appreciate your clarification, Shel, and I agree that we need people to embrace the glasnost. I think for PR/corporate communications people to do otherwise is self-defeating. So instead of just hiring the youngsters and being perplexed and bewildered at this new world that they inhabit, people who are old enough to know what glasnost means should plunge in and immerse themselves. Some may do it half-heartedly and badly, but the solution is to highlight those who are getting it right. It was a great pleasure getting to hear you and the rest of the panel on Thursday.